Dennis Dale "Denny" McLain (born March 29, 1944) is an American former professional baseball player. He played as a pitcher in Major League Baseball for ten seasons, most notably for the Detroit Tigers. In 1968, McLain became the last pitcher in Major League Baseball to win 30 or more games during a season (31–6) — a feat accomplished by only eleven players in the 20th century. McLain was brash and outspoken, sometimes creating controversy by criticizing teammates and fans with little provocation. His stellar performance at the beginning of his professional baseball career, including two Cy Young awards and an American League MVP award, was a marked contrast to his personal life, where he became associated with organized crime and was eventually convicted on charges of embezzlement and served time in prison. McLain was born in Markham, Illinois and attended Mt. Carmel High School in Chicago, where he played on the baseball team as a shortstop and pitcher. As a teenager, he met his future wife, Sharyn Boudreau, the daughter of former major league player Lou Boudreau. McLain was also musically talented, learning to play the organ from his father. Upon his graduation from high school in June 1962, McLain was signed by the Chicago White Sox as an amateur free agent and was assigned to play with the Harlan Smokies of the Appalachian League. McLain made a spectacular debut in professional baseball, throwing a no hitter and striking out 16 batters in a game against the Salem Rebels on June 28. After just two games with the Smokies, he was promoted to the Clinton C-Sox of the Midwest League where he posted a record of 4 wins and 7 losses. McLain began the 1964 season with the Syracuse Chiefs of the International League, but was soon promoted back to the major leagues in early June and ended the season with a won-loss record of 4-5. He then played for the Mayagüez Indians in the Puerto Rico Baseball League, where he posted a 13-2 record and helped the Indians win the league championship. He continued to pitch well for the Tigers in the 1965 season. On June 15, McLain set a major league record for relief pitchers, when he struck out the first seven batters he faced after entering the game in the first inning to relieve starting pitcher, Dave Wickersham. He ended the season with a 16-6 record, a 2.61 earned run average and 192 strikeouts, the third-highest strikeout total in the American League behind Sam McDowell and teammate Mickey Lolich. Although he had a curveball and a changeup, he relied mostly on his fastball to get batters out. In 1966, McLain had a 13-4 record by mid-season to earn the role of starting pitcher for the American League in the 1966 All-Star Game, where he retired all nine batters that he faced with just 28 pitches. He finished the season with a 20–14 record with a 3.92 earned run average. In 1967, the Tigers hired former major league pitcher Johnny Sain as their pitching coach. Sain helped develop McLain's pitching skills and taught him the psychology of pitching. The 1967 season was memorable due to the tight four-way pennant race between the Tigers, the Boston Red Sox, the Minnesota Twins and the Chicago White Sox. McLain finished with a 17–16 record and a 3.79 earned run average and was winless after August 29. On September 18, McLain reported that he had severely injured two toes on his left foot, saying that he had stubbed them after his foot had fallen asleep. Going into the final game of the season against the California Angels, the Tigers needed a victory to force a one-game playoff with the Red Sox for the American League pennant. McLain pitched ineffectively in the final game and the Tigers lost to finish the season one game behind the Red Sox. When the Tigers began the 1968 season in first place, winning nine consecutive games after losing the season opening game, McLain made controversial statements in early May by criticizing Detroit fans for being "the biggest front-running fans in the world." He continued to win games at a remarkable pace, registering his 29th victory on September 10. On September 13, he appeared on the cover of Time magazine. On September 14, at Tiger Stadium in front of a nationally televised audience, McLain pitched the Tigers to a 5-4 victory over the Oakland Athletics to become Major League Baseball's first 30-game winner since 1934. Dizzy Dean, the previous 30-game winner, was on hand to congratulate him. After the Tigers had clinched the 1968 American League pennant, McLain added to his penchant for notoriety while pitching in his 31st victory in a game against the New York Yankees on September 19. McLain had grown up idolizing New York Yankee center fielder, Mickey Mantle, who entered the game tied with Jimmie Foxx for third place in the major league career home runs list. When Mantle came to bat in the eighth inning with McLain and the Tigers holding a 6-1 lead, McLain intentionally threw a soft pitch directly over home plate. Other accounts say that he called catcher Jim Price to the mound and had him tell Mantle that he would be throwing only fastballs. Mantle hit the pitch for his 535th career home run, putting him in sole possession of third place on the all-time home run list, behind only Babe Ruth and Willie Mays. As Mantle ran around the bases, McLain stood on the pitcher's mound and applauded. Mantle tipped his hat to McLain as he rounded the bases. The next batter, Joe Pepitone, waved his bat over the plate, as if asking for an easy pitch of his own. McLain responded by throwing the next pitch over Pepitone's head. After the game, McLain smilingly denied that he had served up an easy pitch for Mantle to hit, however, he was later reprimanded by Major League Baseball Commissioner William Eckert. McLain produced a 31–6 record along with a 1.96 earned run average, as the Tigers led from start to finish to win the American League pennant. McLain also earned his second All-Star berth and won the 1968 American League Cy Young Award as well as the American League Most Valuable Player Award, the first by an American League pitcher since Bobby Shantz in 1952 and the first by a Tiger since fellow pitcher Hal Newhouser's back-to-back honors in 1944 and 1945. He was the first pitcher in the history of the American League to win the Most Valuable Player Award and the Cy Young Award in the same season. St. Louis Cardinal Bob Gibson would win the National League's Most Valuable Player Award that same year, making 1968 the only season to date in which a pitcher won the MVP Award in both leagues. McLain's performance in the Tigers' 1968 World Series triumph over the Cardinals was not as impressive as his regular season. Having already pitched 336 innings and 28 complete games during the regular season, a sore-armed McLain lost twice to Gibson (including a still-standing World Series record 17-strikeout performance in the opener) to help put the Tigers down three games to one. Trailing three games to two, McLain won the crucial Game 6 on just two days' rest, aided by a grand slam home run from Jim Northrup. Teammate Mickey Lolich won three games during the series, including a complete game triumph in Game 7 against Gibson, and won the World Series MVP award. After the season, when McLain was asked about Lolich's performance in the World Series, he responded controversially by saying: "I wouldn't trade one Bob Gibson for 12 Mickey Loliches." The season became known as the year of the pitcher, with batting averages and run production dropping in both the American and National Leagues. After the record home run year by Roger Maris in 1961, the major leagues increased the size of the strike zone from the top of the batter's shoulders to the bottom of the knees. Pitchers such as McLain and Gibson among others dominated hitters, producing 339 shutouts in 1968. Carl Yastrzemski would be the only American League hitter to finish the season with a batting average higher than .300. In the National League, Gibson posted a 1.12 earned run average, the lowest in 54 years while, Los Angeles Dodgers pitcher Don Drysdale threw a record 58 and two-thirds consecutive scoreless innings during the 1968 season. As a result of the dropping offensive statistics, Major League Baseball took steps to reduce the advantage held by pitchers by lowering the height of the pitcher's mound from 15 inches to 10 inches, and by reducing the size of the strike zone for the 1969 season. McLain's success on the playing field allowed him to receive endorsements from the Hammond Organ Company and to make musical appearances in Las Vegas. He was invited to appear with his musical quartet on The Ed Sullivan Show along with his World Series opponent (and guitarist) Bob Gibson. McLain also made appearances on The Steve Allen Show and the The Joey Bishop Show. He would go on to release two albums on Capitol Records, Denny McLain at the Organ (1968) and Denny McLain in Las Vegas (1969). In January 1969, McLain was selected as the Associated Press Male Athlete of the Year. He created more disruption when he was named as the starting pitcher for the American League in the 1969 All-Star Game in Washington, D.C., but missed the start of the game because of a dental appointment in Detroit. The appointment was scheduled for Wednesday the 23rd, the day after the All-Star game, but because of a rainout on the scheduled date, the game was played on the 23rd. McLain was a non-conformist and liked to play by his own rules. He had purchased an airplane and learned to fly. Having kept his dental appointment, he then flew himself to Washington, arriving at the game during the second inning. He pitched in the fourth inning, but by then the National League had already built a 9-2 lead. McLain created more dissension when he clashed with Tigers' manager Mayo Smith over the latter's role in the firing of Johnny Sain as the team's pitching coach. Despite the troubles, McLain had another productive season in 1969, winning 24 games and a second consecutive Cy Young Award, tying with Baltimore's Mike Cuellar, marking the first time two players had shared the award. It would be the last award of his major league career. In February 1970, Sports Illustrated and Penthouse magazines both published articles about McLain's involvement in bookmaking activities. Sports Illustrated cited sources who alleged that the foot injury suffered by McLain late in 1967 had been caused by an organized crime figure stomping on it for McLain's failure to pay off on a bet. Early in his career, McLain's interest in betting on horses was piqued by Chuck Dressen, one of his first managers. McLain's descent into his gambling obsession was further precipitated by an offhand remark made during an interview: that he drank about a case of Pepsi a day. (When he pitched, he was known to drink a Pepsi between innings.) A representative from Pepsi then offered McLain a contract with the company, just for doing a few endorsements. McLain soon realized that he and the Pepsi rep shared an affinity for gambling; when the two realized how much money they were losing, and that they could earn so much more by "taking the action" on bets, they attempted to set up a bookmaking operation as hands-off, silent partners. On October 9, 1970, McLain was traded by the Detroit Tigers with Elliott Maddox, Norm McRae and Don Wert to the Washington Senators for Joe Coleman, Eddie Brinkman, Jim Hannan and Aurelio Rodríguez. Kuhn actually had to clear the trade because McLain was still under suspension, and suspended players can't be traded without the commissioner's permission. Kuhn later wrote in his autobiography, Hardball: The Education of a Baseball Commissioner, that he was shocked at what he called a "foolish gamble" by the Senators, and predicted that the trade would turn out to be a Tiger heist. The McLain trade was made over the strenuous objections of Senators manager Ted Williams, who had little patience for McLain's high living. The feeling was mutual; early in the 1971 season he became a charter member of the "Underminers' Club", a group of five players dedicated to getting Williams fired. They spent much of the season feuding over Williams' use of a then-unusual five-man rotation for his starters. Senators broadcaster Shelby Whitfield later told Rob Neyer that when Williams yanked McLain early from a July 5 game against the Cleveland Indians, McLain threatened to call Senators owner Bob Short and have him get rid of Williams. By this time, McLain had serious arm trouble, inadvertently made worse by numerous cortisone shots he took for his sore arm. As a result, he essentially stopped throwing fastballs midway through the 1971 season. Due to his arm troubles and his inability to get along with Williams, McLain went 10–22. He thus earned the dubious distinction of going from leading his league in wins (tied with Mike Cuellar with 24 wins in 1969) to two years later leading his league in losses. McLain's 22 defeats (a mark later tied by three pitchers, all in 1974) remains the most in a major league season since Jack Fisher of the Mets lost 24 in 1965. After the 1971 season, McLain was traded to the Oakland Athletics for journeyman pitcher Jim Panther and prospect Don Stanhouse (who would go on to have a few good years as the Baltimore Orioles' closer in the late 1970s). After only five starts, one win and a 6.04 ERA, the Athletics traded him to the Atlanta Braves for Orlando Cepeda; he went only 3–5 for Atlanta, and his overall totals for 1972 were 4–7 with a 6.37 ERA. His final major league appearance came on September 12 against the Cincinnati Reds; he came into a tied game in the ninth and promptly gave up three runs without retiring a batter, taking the loss (coincidentally, the last batter McLain ever faced in the major leagues was Pete Rose, who would also be involved in a gambling scandal years later). The Braves released McLain during spring training, on March 26, 1973. After short stints with minor league clubs in Des Moines and Shreveport, McLain retired. At the age of 29, he was out of baseball. In a 10-year major league career, McLain won 131 games against 91 losses. His career earned run average was 3.39 and he recorded 1,282 strikeouts in 1,886 innings pitched. McLain was a three-time All-Star and won the Cy Young Award twice in his career. Because he relied so much on his fastball, he also surrendered numerous home runs, leading the American League in home runs allowed in three consecutive years (1966–1968). Since McLain's 31-win season, only two other pitchers have approached the 30-game milestone (Steve Carlton won 27 games in 1972 and Bob Welch also with 27 victories in 1990). With Major League Baseball moving from the four-man pitching rotation of McLain's era to five-man rotations, and with the increased reliance on relief pitchers, some observers believe that there may not be another 30-game winner as the game is played today. In 1974, McLain played a season for the London Majors of the Intercounty Baseball League at Labatt Memorial Park in London, Ontario, Canada. Given his arm problems, McLain only pitched nine innings for the Majors, but he did play in 14 games at either shortstop, first base or catcher and batted .380, including hitting two homers in one game in London. McLain continued to earn side money playing the organ at clubs, including a club in suburban Detroit with former heavyweight boxing champion Leon Spinks working as a bartender. McLain also earned quite a bit of money hustling golf, easily attracting 'marks' due to his past baseball fame. Additionally, he reportedly once accepted over $160,000 to fly a wanted felon out of the country. In his post-baseball career, his weight ballooned to 330 pounds (150 kg). He was imprisoned for drug trafficking (cocaine), embezzlement, and racketeering with Anthony Spilotro and later John Gotti Jr. Attorney Lawrence R. Greene represented McLain before the United States Court of Appeals for the Eleventh Circuit in Atlanta, where his conviction under the Racketeer Influenced and Corrupt Organizations Act (RICO) in the United States District Court for the Middle District of Florida in Tampa was reversed. Between his stints in prison and rehabilitation in the mid-1980s to the early 1990s, McLain could be found on various sports shows on talk radio and occasionally on panel-format sports shows on network television in the Detroit area, as well as modeling "Hanes" underwear. He could also be found signing autographs at a metro Detroit 7-Eleven store at the corner of Mound Road and Metro Parkway in Sterling Heights, Michigan, where he was employed on work-release. He also hosted a popular daily talk radio show for a few years after his release on Detroit talk station WXYT. McLain's oldest daughter, Kristin, 26, was killed on March 20, 1992 in a car accident caused by a drunk driver. She had been living in Florida and was moving back home to Michigan when she was killed just a few miles from her parents' home. In part to escape his grief, McLain and several partners bought the Peet Packing Company (Farmer Peet's) located in the small town of Chesaning, Michigan in 1994. McLain was also a partner in the Michigan Radio Network. Both companies went bankrupt two years later. In 1996, he was convicted on charges of embezzlement, mail fraud, and conspiracy in connection with the theft of $2.5 million from the Peet employees' pension fund. McLain spent six years in prison; to this day he insists he knew nothing about the shady financial deals alleged by the government. McLain claims he paid restitution for this incident. During the Detroit Tigers 2006 playoff run, McLain was the baseball analyst for Drew and Mike on WRIF radio in Detroit. In 2007, McLain released his autobiography I Told You I Wasn't Perfect, co-authored by longtime Detroit sportscaster and author Eli Zaret. Prior to that, McLain and Zaret hosted a sports television show together in Detroit. McLain currently resides in Pinckney, Michigan, with his wife, Sharyn. Sharyn had divorced Denny during the latter's most recent incarceration, but remarried him upon his release. McLain writes a monthly editorial column and blogs regularly for In Play! Magazine, a Detroit sports magazine. Kevin Costner's character in the motion picture The Upside of Anger was partly based on McLain (and also partly on Kirk Gibson, another Tiger of World Series note). On April 11, 2008, McLain was arrested without incident after deputies discovered an outstanding warrant against him for failing to appear for a January 16 court hearing. On September 22, 2011, McLain was arrested in Port Huron, Michigan at the Canada–US border after officials discovered an outstanding warrant against him from St. Charles Parish, Louisiana. Because of construction detours, McLain had inadvertently taken an exit off I-94 that sent him directly across the Bluewater Bridge and into Canada. He immediately returned to the U.S. where he was obligated to go through a U.S. Custom and Border Protection inspection booth. The outstanding warrant was discovered and McLain was jailed in Port Huron, Michigan. In less than a week, the warrant was cleared and McLain was released. 1 2 3 4 5 6 7 8 9 10 11 12 13 14 15 16 17 18 "Denny McLain statistics". Baseball-Reference.com. Retrieved December 22, 2011. 1 2 3 4 5 6 7 8 Acocella, Nick. "From the big time to the big house". espn.go.com. Retrieved December 24, 2011. ↑ 30-Game Winners Since 1900. Baseball Digest. October 1988. Retrieved December 28, 2011. 1 2 3 4 5 6 7 8 9 10 11 12 13 14 15 16 17 18 19 20 21 22 23 24 25 26 Armour, Mark. "The Baseball Biography Project: Denny McLain". Society for American Baseball Research. Retrieved December 20, 2011. 1 2 3 4 Thomashoff, Craig (March 2002). Fallen Star: The Downfall of Former Pitcher Denny McLain. Baseball Digest. Retrieved December 23, 2011. 1 2 3 "Denny McLain minor league statistics". Baseball-Reference.com. Retrieved December 22, 2011. ↑ "Denny New Strikeout King". The Vancouver Sun. June 16, 1965. p. 29. Retrieved December 22, 2011. ↑ "1965 American League Pitching Leaders". Baseball-Reference.com. Retrieved December 22, 2011. ↑ "1966 All-Star Game". Baseball-Reference.com. Retrieved December 22, 2011. ↑ "McLain Set Down NL Stars On 28 Pitches". The Morning Record. Associated Press. July 13, 1966. p. 4. Retrieved December 22, 2011. 1 2 Sargent, Jim (February 2004). Jim Northrup Recalls His Playing Days With Tigers. Baseball Digest. Retrieved December 24, 2011. 1 2 3 4 5 6 "1968: Year of the Pitcher". thisgreatgame.com. Retrieved December 25, 2011. ↑ "1967 Denny McLain pitching log". Baseball-Reference.com. Retrieved December 22, 2011. ↑ "1967 American League Team Statistics and Standings". Baseball-Reference.com. Retrieved December 22, 2011. ↑ "1968 Detroit Tigers Schedule, Box Scores and Splits". Baseball-Reference.com. Retrieved December 23, 2011. ↑ "McLain Blasts Detroit Fans". The Evening Independent. May 6, 1968. p. 3. Retrieved December 23, 2011. ↑ "1968 Denny McLain pitching log". Baseball-Reference.com. Retrieved December 25, 2011. ↑ Rushin, Steve (July 19, 1993). "The Season Of High Heat". Sports Illustrated: 5. Retrieved December 25, 2011. ↑ "TIME Archive". time.com. Retrieved December 26, 2011. 1 2 "Denny McLain becomes a 30-game winner". history.com. Retrieved December 25, 2011. 1 2 3 "McLain now has 31 and Mantle has 535". The Ottawa Citizen. Associated Press. September 20, 1968. p. 19. Retrieved December 22, 2011. ↑ "1968 American League Team Statistics and Standings". Baseball-Reference.com. Retrieved December 22, 2011. ↑ "1968 All-Star Game". Baseball-Reference.com. Retrieved December 22, 2011. ↑ "1968 American League Most Valuable Player Award voting results". Baseball-Reference.com. Retrieved December 22, 2011. ↑ "1968 American League Cy Young Award voting results". Baseball-Reference.com. Retrieved December 22, 2011. ↑ "Denny McLain post-season statistics". Baseball-Reference.com. Retrieved December 22, 2011. ↑ "1968 World Series Game 6 box score". Baseball-Reference.com. Retrieved December 22, 2011. ↑ "1968 World Series". Baseball-Reference.com. Retrieved December 22, 2011. ↑ "Expanded strike zone unveiled". The Press-Courier. Associated Press. March 8, 1963. p. 9. Retrieved December 25, 2011. ↑ "McLain Says Lower Mound Will Take Toll of Pitchers". The Telegraph-Herald. Associated Press. January 14, 1969. p. 13. Retrieved December 25, 2011. ↑ "Denny Will Take More". The Evening Independent. September 6, 1968. p. 2. Retrieved December 23, 2011. ↑ "Gibby, McLain to Appear After Series". The Pittsburgh Post-Gazette. October 9, 1968. p. 22. Retrieved December 23, 2011. 1 2 Rushin, Steve (July 19, 1993). "The Season Of High Heat". Sports Illustrated: 1. Retrieved March 7, 2015. ↑ "Denny McLain Discography". allmusic.com. Retrieved December 23, 2011. ↑ "Denny McLain Is Named Male Athlete of the Year". The Miami News. Associated Press. January 23, 1969. Retrieved December 23, 2011. 1 2 "Denny McLain Returns in Time To View AL All-Star Disaster". The Day. New York Times News Service. July 23, 1969. p. 21. Retrieved December 23, 2011. ↑ "1969 All-Star Game". Baseball-Reference.com. Retrieved December 23, 2011. ↑ "Cuellar, McLain Involved in First Young Award Tie". The Free-Lance Star. Associated Press. November 6, 1969. p. 8. Retrieved December 22, 2011. 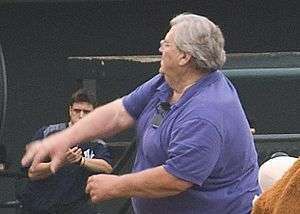 ↑ "Kuhn Suspends Tiger Ace Denny McLain". The Deseret News. Associated Press. February 20, 1970. p. 8. Retrieved December 23, 2011. ↑ "Senators Get Denny McLain". The Free Lance-Star. Associated Press. October 10, 1970. p. 7. Retrieved December 23, 2011. 1 2 Purdy, Dennis (2006). The Team-by-Team Encyclopedia of Major League Baseball. New York City: Workman Publishing Company. ISBN 0-7611-3943-5. 1 2 3 Neyer, Rob (2006). Rob Neyer's Big Book of Baseball Blunders. New York City: Fireside. ISBN 0-7432-8491-7. ↑ "A's Give McLain For Brave Cepeda". The Milwaukee Sentinel. Associated Press. June 30, 1972. p. 1. Retrieved December 23, 2011. ↑ "McLain Released By Braves". Sarasota Herald-Tribune. Associated Press. March 27, 1973. Retrieved December 23, 2011. 1 2 Niedzielka, Amy (August 1993). Will Majors Ever Produce Another 30-Game Winner?. Baseball Digest. Retrieved December 23, 2011. ↑ "Star-crossed stars cross paths". The Pittsburgh Press. Associated Press. February 27, 1989. p. 1. Retrieved December 23, 2011. ↑ Rushin, Steve (July 19, 1993). "The Season Of High Heat". Sports Illustrated: 8. Retrieved December 25, 2011. ↑ Coffey, Wayne (April 5, 2008). "On 40th anniversary of 31-win season, Denny McLain reflects on life". Daily News. New York. ↑ "The Upside of Anger (2005) Trivia". Internet Movie Database. Retrieved December 30, 2014. ↑ "Ex-Tigers pitcher McLain in jail after missing court appearance". sports.espn.go.com. Retrieved December 23, 2011. ↑ "Former Tigers' pitcher McLain arrested on warrant". sports.yahoo.com. Retrieved December 23, 2011. Nobody's Perfect by Denny McLain with Dave Diles (The Dial Press, New York, 1975). Strikeout: The Story of Denny McLain by Denny McLain and Mike Nahrstedt (Sporting News, 1988). I Told You I Wasn't Perfect by Denny McLain and Eli Zaret (Triumph Books, 2007). Thirty-one and six: The story of Denny McLain by Robert B. Jackson (H. Z. Walck, 1969).